Although Elmar Bridal carries a wide selection of dresses for Flower Girls and Bridesmaids, our main focus is on providing Brides with a choice to suit every taste and budget. 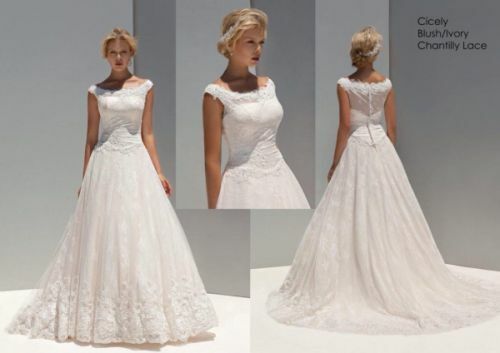 Whatever your needs, wedding theme and personal preference we will have a dress to make your special day complete. 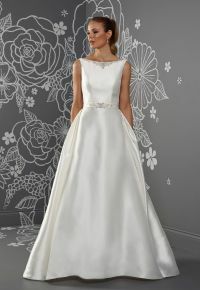 Offering one of the most diverse collections in northeast Scotland, we have gowns available in every size from 10 to 28. There is something for everyone, no matter whether you're hoping to convey the timeless romance with a classical style or have your mind set on something which speaks of contemporary designer sophistication. Whatever style you envisage, Elmar Bridal is able to offer many designer garments in a variety of colours which range from the subtle shades of cream and white to sultry and smouldering crimson. When it comes to a choice of the most respected names in wedding design, we carry collections from such luminaries as Mark Lesley, Romantica, Callista, Twilight Designs and True Bride. Those looking for the truly rare, might like to choose a gown from the Phil Collins collection, a Devon designer for who we are the sole stockist in northeast Scotland. Of course, a great dress is in itself something of a treasure, but a bridal outfit is never fully realized until the final touches and details are added. To properly complement our collection of dresses, we have chosen a range of veils and tiaras which will add that additional personal touch to any outfit. Brides can choose veils from designers like Joyce Jackson, Amanda Wyatt and Emmerling to name only a few. Our collection of tiaras is second to none and includes, among others, a choice of prize creations from Richard Designs, Princess Bijou, John Frost and Emmerling. Our collection coupled with our extensive experience and personal service make Elmar Bridal more than just a Bridal Wear Studio, it is our aim to work closely and carefully with all our customers so that the smallest considerations are taken into account in order to make your wedding day the substance of dreams.